Ottawa-born Deepan Budlakoti, 24, will appear in Supreme Court Monday, June 16, 2014 trying to get his Canadian citizenship back. The process has begun to deport the young man — convicted of selling a rifle to an undercover police officer when he was 19 — to India because that’s where his parents are from, but haven’t lived since 1984. An Ottawa man tried to drum up support for efforts to get his Canadian citizenship back, by speaking at an immigration detention rally Sunday afternoon. Like immigrants, he is fighting for his life to stay here. 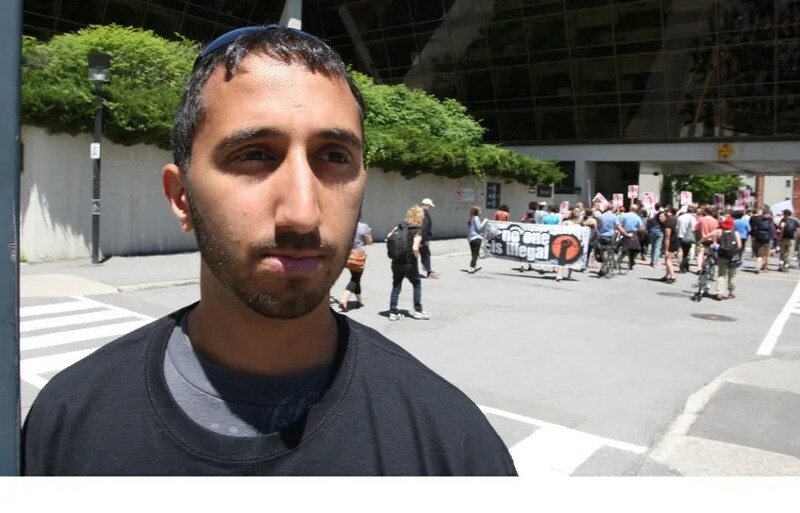 Deepan Budlakoti, 24, appears Monday morning in Supreme Court and was hoping the group who gathered to march from the University of Ottawa to CBSA headquarters Sunday, would be there to support him. Budlakoti is facing deportation to India after he was busted when he was 19 for trying to sell a rifle to an undercover police officer. The trouble is, Budlakoti wasn’t born there — he was born here. His parents are from India but haven’t been back in that country since 1984. A large segment of the more 100 protesters seemed to agree to join him outside the Wellington St. courthouse at 8:30 a.m. — an hour ahead of his court appearance. Sunday they were marching to bring attention to their own demands to end immigration detention — following a three-day conference and week of activities. The group claims FOI requests appear to show political interference in the immigration detention review processes. They say detention release rates in Ontario have steadily dropped since 2008 when they were 21%, to 11.5% in 2012 and 9.3% in 2013. Protesters say nearly 80,000 immigrants have been detained under the current federal government. More than a third are held in one of 142 mostly maximum-security prisons across Canada where there is no limit on how long they can be held. At least 203 children were detained in 2013. The marchers Sunday were drawing a link between Father’s Day and the detentions, as they claim the practice is detrimental to families. “There needs to be some justification for breaking up families and locking people away without trial,” said event spokeswoman Tings Chak. The Canadian Civil Liberties Association is backing Budlakoti. They say Canada is violating international law by stripping him of his citizenship, and have made a formal complaint to the United Nations. He’s currently living at home with his family but is unable to work or attend school. He has never lived in India.